At PetSafe® Brand, we believe every pet deserves to have fun. And so we created a range of toys to ensure a longer lasting playtime, giving hours of fun and stimulation for pets of all ages. 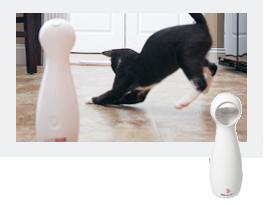 FroliCat™ Teaser and Laser toys provide fun exercise for your pet. FroliCat laser toys engage your pet in hours of fun, interactive play using random laser patterns. Point the laser yourself or let the toy do it automatically. Your cat will be bouncing off the walls to catch that little red dot. Generates random laser patterns for hands-free play. Great for cats!